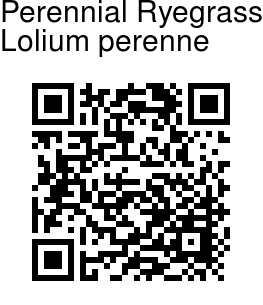 Perennial Ryegrass plant is a low-growing, tufted, hairless grass, lacking stolons or rhizomes. The leaves are dark green, smooth and glossy on the lower surface, linear, with prominent parallel veins on the upper surface. The leaves are folded lengthwise in bud with a strong central keel, giving a flattened appearance. The ligule is very short and truncate, often difficult to see, and small white auricles grip the stem at the base of the leaf blade. Leaf sheaths at the base are usually tinged pink and hairless. Stems grow up to 90 cm. 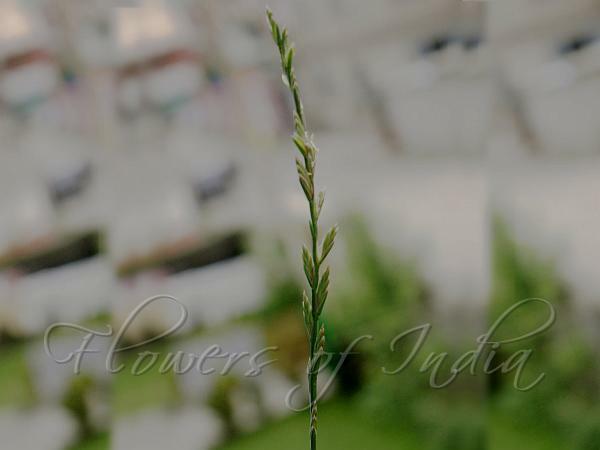 The inflorescence is unbranched, with spikelets on alternating sides edgeways-on to the stem. Each spikelet has only a single glume, on the side away from the stem, and multiple fertile Florets without awns. The Anthers are pale yellow. Flowering: May-July. Photographed in Balgarden, Srinagar, Kashmir.